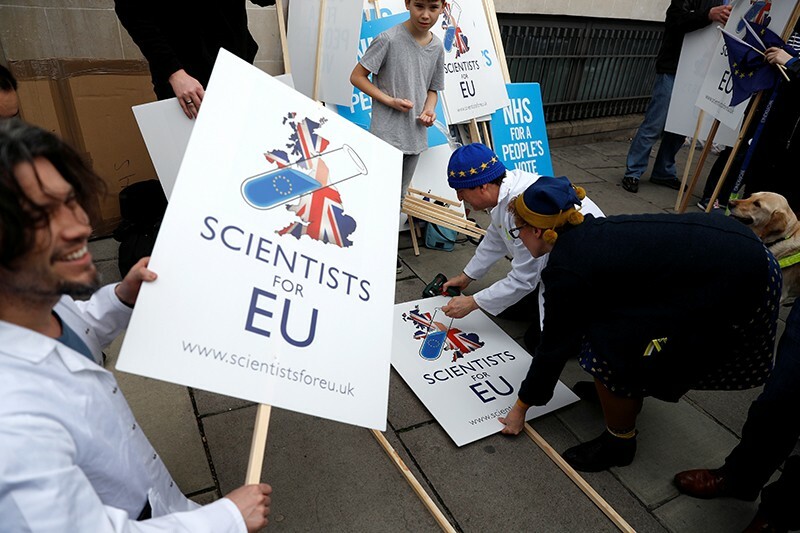 Scientists took to the streets of London on 23 March as part of a major demonstration calling for the terms of Brexit to be put to the British people in a vote. The deal, agreed between UK and EU officials last November, has been divisive among UK politicians. It would allow the United Kingdom to leave the EU and enter a 20-month transition period in which the UK–EU relationship — including science funding and immigration rules — would stay largely the same. During this time, the two sides would negotiate the terms of the United Kingdom’s future relationship with the bloc. But many politicians say the deal could leave the United Kingdom indefinitely entangled with the EU without a say over regulations because of a controversial policy called the Irish ‘backstop’. Susan Lea, a structural biologist at Oxford, who attended the rally with her team, says that three-quarters of her group are from outside the United Kingdom. Since before the Brexit referendum in June 2016, in which the British people voted by a slim margin to leave the EU, UK scientists have broadly said that Brexit would be a disaster for research. The split would disrupt collaboration, immigration and funding, they say, and threaten access to the EU’s multi-million-euro research programmes, from which UK scientists have historically drawn outsize benefits. Many scientists and research leaders have said that the uncertainty caused by Brexit has already damaged British and European science. “This is a crucial issue for scientists because science relies on rational thoughts, facts, collaborations and openness, and Brexit basically goes against all these values,” says Jean-Martin Lapointe, a pharmaceutical researcher at drug company AstraZeneca near Cambridge. He says that although scientists are often silent politically, he feels it is important to get involved. Lapointe adds that AstraZeneca is already having issues with shipping samples and getting permits because of Brexit. “People are refraining from making plans that involve collaborations with other sites and countries, and it is having a chilling effect on a lot of aspects of our research,” he adds. May has so far failed to get her hard-negotiated deal approved by UK members of Parliament (MPs), who have rejected it twice. EU leaders have agreed to delay departure until 22 May as long as MPs back the deal. If the deal does not pass, May has until 12 April to forge new way forward or the United Kingdom will crash out of the EU without any trade or migration agreements, which is widely predicted to cause chaos. This ‘no deal’ scenario would cut Britain off from EU research funding overnight and disrupt clinical trials, data collection and the import of lab supplies. Although the government has agreed that it would supply the lost money for existing EU grants and successful bids made before 2021, the details of how this would happen remain unclear. Additional reporting by Nisha Gaind.